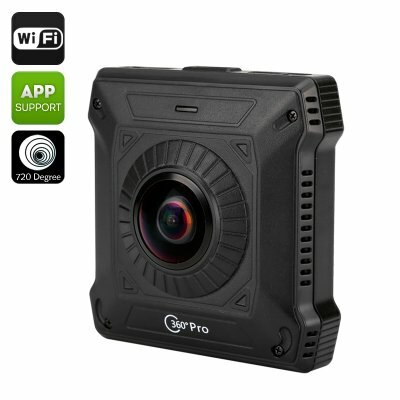 Successfully Added 720 Degree View Action Camera - Two Back To Back Cameras, Wi-Fi, 1/4 Inch CMOS Sensor, SD Card Recording, H.264 to your Shopping Cart. Capture the world with a 720 degree action camera. Two back-to-back cameras ensure a truly unique view and let your capture mind blowing footage. Featuring a 1/4 inch CMOS sensor and 1280X1024 resolution, the action cam offers great quality video and crisp shots. You may think is just your regular action camera — it is, by the looks of it. But featuring 720 degree video recording, this sports cam is anything but ordinary. Designed with two cameras back to back, it not offers incredibly immersive footage, letting you record from two different view points on the one device. You will also have several recording modes: spherical panorama (touch), spherical panorama (posture), flat panorama and fisheye. Whether you are into action sports or not, the camera offers a truly unique perspective in the world and would make a great companion for traveling, hiking, camping or even simply riding a bike. With its unique ability to capture different view points, you will be able to film the road ahead in 360 as well as yourself riding the bike. How much more immersive can it get really? The 720 degree sports cam comes with a 1/4 inch CMOS sensor for clear an crisp images and is able of recording with 1280x1024 resolution. The cam supports SD card recording and you will be able to get up to 32GB of storage space. Thanks to H.264 compression, your videos will be stored efficiently, without taking up too much space or compromising quality. The 2600mAh built-in battery offers up to 3 hours of non-stop working time. The cam also comes with mobile access support, for both iOS and Android. The 720 Degree View Action Camera comes with a 12 months warranty, brought to you by the leader in electronic devices as well as wholesale action cameras..
Pros: Good service. Quick shipping and thorough packaging, cheaper than other sellers. Easy to operate. Cons: User manual is not enough detailed, but it is possible to turn by himself. Thanks to seller.